Welcome back to another installment of the #MGTop10! 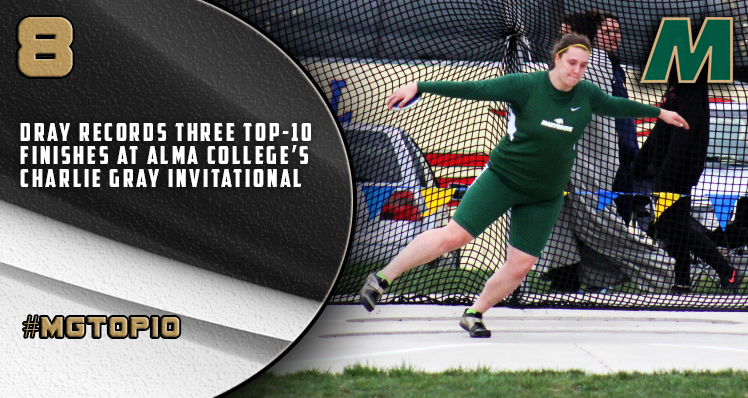 Today’s moment highlights the number eight spot in our countdown, a trifecta of top-10 finishes for sophomore throws specialist Theresa Dray at Alma College’s Charlie Gray Invitational. On April 3, Dray dominated the competition en route to placing second inÂ shot put, ninth in the hammer throwÂ and 10th in the javelin. The strong day marked the first time Dray posted three top-10 finishes in her brief two-year collegiate throws career. Sisters Amber Staudt and Rachel Staudt joined Dray to post well-rounded days at the Charlie Gray Invitational as well.Â Want to get in on the conversation? Additional conversation and releases can be found on our social media pages throughout the duration of the series. UseÂ #MGTop10Â or tweet toÂ @MGroveAthleticsÂ to interact with us daily. READ THE FULL STORYÂ HERE! ALMA, Mich. –Â First-year head coachÂ Cary OssiffÂ and the Marygrove women’s track squad started the spring 2015 campaign on a high note Friday (April 3) at the Charlie Gray Invitational. The event, hosted by Alma College, was the Mustangs first taste at outdoor action after last week’s meet in Ohio was cancelled due to inclement weather. Theresa Dray (Davison, Mich./Davison High School) led a well-rounded day for the Mustangs with a second-place finish in the shot put. Dray, a sophomore women’s basketball player for the Mustangs, posted a throw of 10.59m to finish less than a meter off the first-place pace. Blair Secord, a senior for the host Alma College Scots, recorded a toss of 11.24m to fend off Dray’s stellar 2015 debut in the shot put. SistersÂ Rachel StaudtÂ andÂ Amber StaudtÂ followed Dray with throws of 9.41m and 8.12m, respectively. The tosses landed the Staudt sisters in sixth and seventh place as in the shot put to complete one of three solid events for the Mustangs on the day. In the discus,Â Rachel StaudtÂ (Novi, Mich./Lawrence Technological University) checked in at seventh place after throwing 27.79m. The Mustangs continued their successful day in the hammer throw as Dray qualified for the finals en route to tossing 30.97m â her first attempt at the hammer at the any level. Dray’s 30m-plus throw landed her in ninth amongst a loaded field at Alma on Friday. The Staudt sisters were at it again, this time in the Javelin as Rachel and Amber chimed in with throws of 24.83m and 23.39m, respectively. The throws landed both in the top five as Dray followed closely in 10thÂ after posting a throw of 17.09m. The Mustangs will return to action April 11 at the Northwood Open.